VAN DER HUT R, DIJKSHOORN D, HOOYMANS J, HYLKEMA J & VAN DE KAMP J (2016) Tracking Spotted Crakes Porzana porzana: calling activity and habitat selection in a Frisian peat bog. 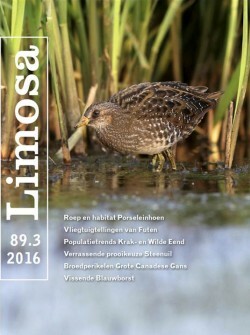 LIMOSA 89 (3): 97-107. Habitat selection of Spotted Crakes was studied in Houtwiel, a peat bog of c. 100 ha in the Dutch province of Fryslan. The area consists of former meadows, where water tables have been raised around 2006. Since then, vegetation is dominated by Soft Rush and Sweet Reed Grass in shallow water and by Common Reed along former ditches. Fields are flooded in the winterperiod and dry out during summer. The area is grazed by ponys and Highland cattle. Census visits (twice a week during April-June) revealed 18-21 territories in 2012-2014 and 10 in 2015. Four individuals, two males and two females, were caught and radio-tagged. Habitat data were collected at calling locations, radio-tracking positions, nest sites and random locations. Camera traps were used to study foraging behavior. The guidelines of the national breeding bird scheme led to a considerable underestimation of the number of territories, due to a low frequency of area visits (once in 10-14 days) and criteria that disregard most April observations. Shallow water, low vegetation stands, open patches and patchiness appeared to be important habitat factors at calling and foraging locations. Nesting habitat differed from foraging locations by high vegetation cover; nests were built in Soft Rush tussocks within low stands of Sweet Reed Grass. Dynamic water tables and small scale relief affect vegetation development and the availability of shallow water patches, which are crucial for foraging. Grazing management seemed to be important in creating patchiness in vegetation structure by walking tracks and grazing patterns. Grazing by Greylag Geese had a similar effect. The introduction of dynamic water tables in meadows with small scale relief, combined with grazing management, provide opportunities to increase breeding numbers.